What is included in the price of your villa? What is not included in the price of your villa? The only people eligible to stay in the villa are those listed on the booking details, and the number of guests should not exceed the stated maximum occupancy for the villa unless by prior arrangement and agreement. Our booking conditions outline the terms under which we operate, they advise you of both your obligations and also ours to you. Please ensure you read them carefully before proceeding with your booking. The principle guest who completes the booking information on line, must be 18 or over and one of the travelling party. Once the booking form information is completed this certifies that he/she is authorised to agree to our Terms & Conditions and acts on behalf of all persons included on the Booking Form. Including any additional guests added at a later date. Any specific requests should be made at the time of booking, such as cots, highchairs; car-hire etc, therefore avoiding any disappointment during busy and peak seasons, all applicable charges will be advised at the time. Please ask for it and check to ensure that everything you booked (flights, hotels and other services) is listed on it. 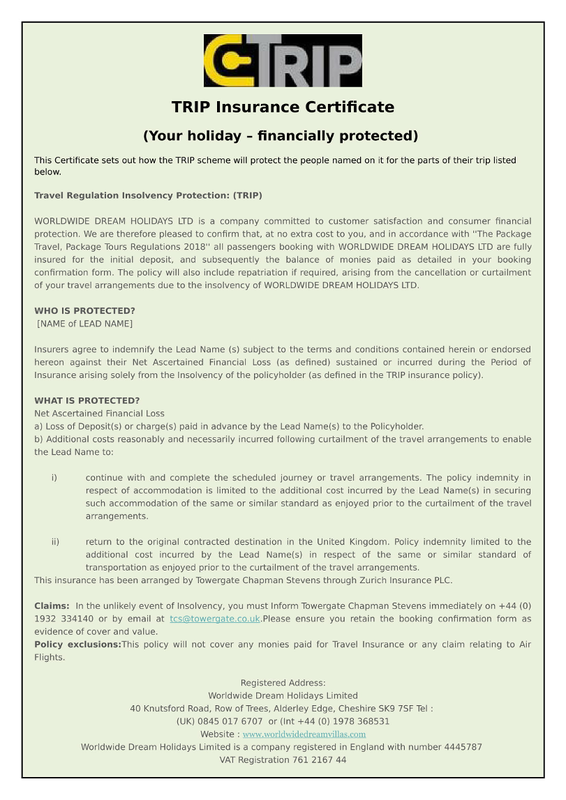 Please see our booking conditions for further information or for more information about financial protection. Each villa is different from the next and so we ask that if you have any specific needs you let us know at the time of your enquiry so we can offer you the most suitable and available property. The various designs and locations of some villas we offer, may lack in the simplest of facilities for the less able guest, such as wheel chair ramps and wide door access, we will always try to offer what we feel is the most suitable villa based on the information provided by you or we will advise you if we feel we are unable to accommodate your request at this time. Pool heating for your arrival can be arranged ( where applicable), however bear in mind a pool can take a few days to heat, this may take longer if this is solar powered and the sunlight is minimal. Let us know what special requirements and requests you have, and we will do all we can to make the necessary arrangements and advise you if there are any additional charges that you would need to pay. Some destinations operate a specific arrival and departure day (particularly in Europe) and minimum stays, which can be from 7 nights to one month, particularly during busy and peak season, please check with our sales team for further information. Check-in and Check-out times can vary between properties/ hotels. As a guide we advise check-in times to be from 3pm and check-out times before 10am. Final check-in and check-out times will be advised on your final documentation. Request for an early check-in or a later check-out can be requested and will be subject to final confirmation with the owner as this will depend on the arrival and departure of other guests on the change over days, so may not be confirmed until near to the travel date. We recommend that you advise us of your requirements at the onset of your enquiry, this may involve an additional charge. If your arrival is delayed for any reason you should inform the local contact person noted on the final documentation which is sent once full balance is received for your holiday. If you arrive after 19.00 in Europe without prior arrangement you may not be able to gain access to the property until the following day. Or a charge may be levied by the owner to arrange for local staff to organise late access. For those people who are happy to drive themselves , where necessary, easy to follow directions to your chosen villa will be provided with your final documentation. We recommend for long haul destinations and more remote villa locations that we arrange private transfers for you and your family, relevant charges available on request. In certain locations Helicopter transfers can also be arranged (not after dusk) but your luggage may need to travel by road, so we therefore advise that you take an overnight bag in case your luggage arrives later. In many of the properties there will be some local information i.e. restaurants, events and activities etc along with contact numbers for the local villa management company and local emergency assistance i.e. doctor, dentist etc. All villa agents/owners require an additional deposit, to guard against damages etc to the property. This security/damage deposit is to guarantee protection of the property and go towards the cost of any breakages or damage, along with providing payment for any telephone calls and any additional costs which may occur during your stay. In some destinations, this deposit is requested on arrival and will need to be paid in cash or equivalent to the villa management agent/owners representative, or maybe be requested with the balance payment 10 weeks before. If only an authorization is required and not an actual payment then this will be requested approximately 28 days prior to your departure . This security/deposit amount required varies from property to property ranging from £500 upwards, therefore the required amount is advised on the booking form information, at the time of booking along with the payment method. If you make any telephone calls using the landline at the property, the appropriate charges will be either deducted from your Security/Damage deposit. In some instances the owner/villa management agent reserve the right to hold onto the security deposit until the itemised bill has been received and required payment agreed, this may take up to 3 months in some destinations. Please request further information at the time of booking. Our close working relationship with our owners/ villa management agents ensures that we maintain safety levels at each property. However we must point out that safety standards and requirements do vary by destination, and may not always be equivalent to the UK standards, and in some cases can be lower. Many of the properties have a private swimming pool, where swimming is at your own risk, and particular care and caution should be taken with young children, or considering using the pool whilst under the influence of alcohol, and we also point out that diving is not recommended. Cots/cribs for babies can usually be provided for an additional charge but we advise clients to check the safety standards of the item before using it. If you are in any doubt, we recommend you take your own travel cot. Whilst on holiday clients enjoy a family BBQ, we draw particular attention to keeping a close eye on young children around the BBQ and you exercise great caution when using the BBQ equipment. Some of the access roads to the villas can be more like a off road track and be bumpy or steep, when experiencing these roads we suggest extra care is taken in your hired car. Listed below are additional points for your consideration if you are travelling with younger children or less mobile people in your party. Where villas are on or overlooking a golf course, the maybe a risk of a stray golf ball coming over into the garden which cannot be avoided. In the Western world we take the provision of our Public Utilities for granted, but in some of the tropical or less developed areas you may experience some disruption to the supply, which could be caused by a severe storm or hurricane. A water shortage could also occur during peak or busy seasons. Water from the tap is considered safe in only a few destinations, and so we therefore suggest that you purchase bottled water for drinking. Insects and hot climates are inevitable, and they are attracted to the swimming pools and at certain times you may experience some problems, particularly with mosquitoes and ants. We would recommend you carry a repellent for Mosquitoes. To avoid unwanted insects and birds, keep all food items covered and all rubbish cleared away. You may also encounter a stray dog or cat and if your villa is close to a farm you may hear the morning call from the local cockerel. Pets are not allowed without prior written permission of the Property Owner. An additional security/damage charge may be required if the owner does allow you to bring a pet.